This two-hour walking tour is an absolute must if you're a first-time visitor to Venice! You'll visit St. Mark's Basilica in St Mark's Square and other famous highlights, and discover the 'real Venice' as you enter a labyrinth of narrow passageways and alleys. 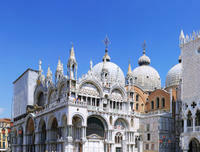 Plus, you'll skip the long lines at St. Mark's Basilica- don't waste time waiting in lines when you're on vacation! Your comprehensive two-hour walking tour highlights all the important monuments, from San Marco Square to the Rialto Bridge. You'll learn the history behind the famous landmarks, plus visit the famed basilica of St. Mark's without having to stand in long queues. Then, you'll discover the 'real Venice', a magical city of meandering canals crossed by delicate bridges. Through the sights and informative commentary provided by your guide, you'll learn how illustrious Venetians such as Marco Polo made Venice such a vibrant and influential power. You'll see Marco Polo's House and hear tales of this legendary globe-trotting Venetian. You'll also discover the Venice of today, and hear what it is like to live in the most beautiful city in the world. The tour conveniently concludes at the Rialto Bridge. Skip the Line! Book your Original Venice Walking Tour ahead of time to take advantage of jumping the queue at St. Marks Basilica. Don't waste time waiting in lines on vacation! Please note: Occasionally the basilica will be closed to the public (without notice) because of religious festivities or high water.